GrandCliff TNT BelCanto or a surprising alliance between 19th and 21st century expertise! 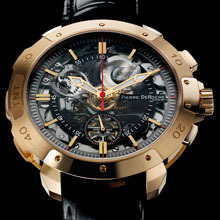 PIERRE DEROCHE merges 19th century hand-crafted know-how with 21st century technologies in three exceptional watches. Authentic 19th century LeCoultre hour & quarter repeater and chronograph pocket-watch movements, modified by Numa Robert-Waelti in around 1894, have finally found the case, dial and hands they deserve in order to set them off to their best advantage. It was in 2007 that Pierre Dubois, Managing Director of PIERRE DEROCHE, discovered these “movement blanks” at an antique dealer's. Having fallen under their spell, he decided to give them a new lease on life in wristwatch form, thereby paying tribute to the great watchmakers who have forged the history of the Vallée de Joux. He also opted to make the least possible technical modifications. While the Dubois Dépraz watchmakers set to work on restoring and reassembling these movements, Pierre Dubois contacted one of the most innovative artisans in the field of dial-making. This encounter gave rise to a stunning sapphire crystal dial serving to admire the wealth of the historical movement: sandblasted on the dial side, and then metallized by PVD on the smoked parts. The voluminous hour-markers were then made by galvanic growth and coloured by 4N gold plating. 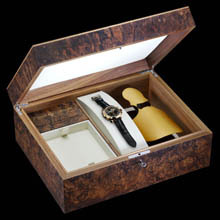 This masterpiece was then housed within an imposing 55.5 mm rose gold case with a highly contemporary design. 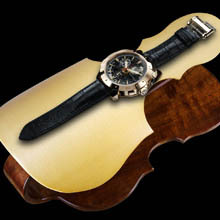 In parallel, an instrument was developed by a luthier in the Vallée de Joux based on the principle of guitar soundboards. The extremely pure sound of the repeater strike is thus magnified when the BelCanto is placed on this base made from spruce wood from the forests of the region.